I'm a sucker for abandoned buildings, homes, theme parks, ghost towns. You name it. I'm one of those people who wants to go visit Chernobyl. 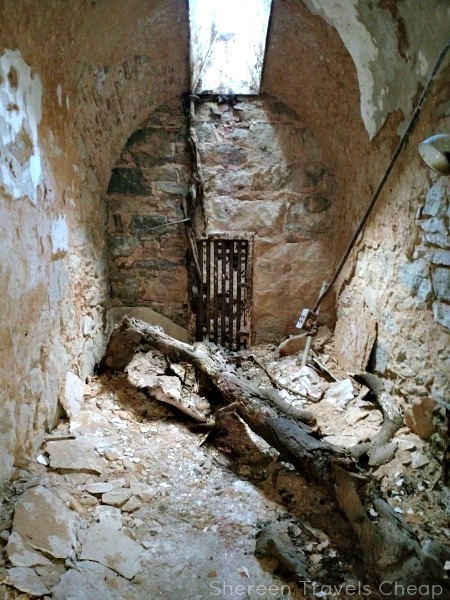 Well, while in Philadelphia, we spent a good chunk of time taking a tour of Eastern State Penitentiary. 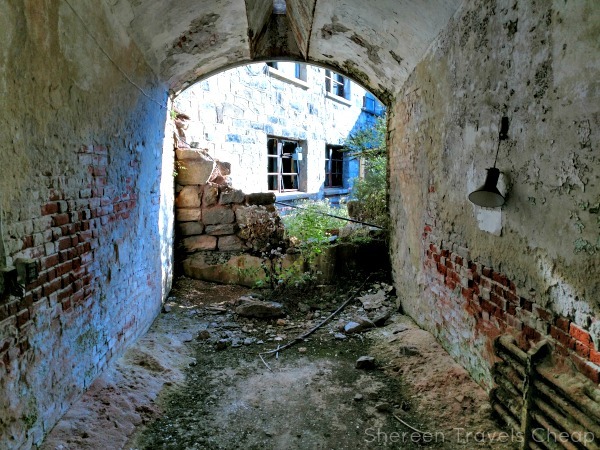 Once the most famous and most expensive prison in the world, it is now crumbling and mostly in disrepair. 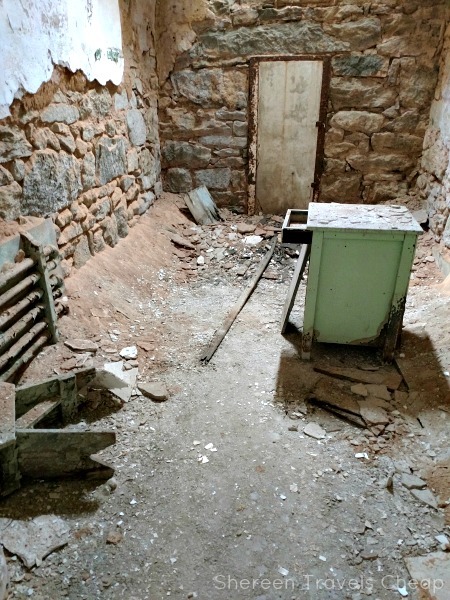 While you may not have heard of Eastern State or been there, you are probably very familiar with the prison. The outside walls were the inspiration for the board on Monopoly. The turrets on the outside forming the large squares on the corners. You'll also find other Monopoly squares around town, such as Water Works and Pennsylvania Railroad, since the game was invented in Philadelphia, but let's get back to the big board. 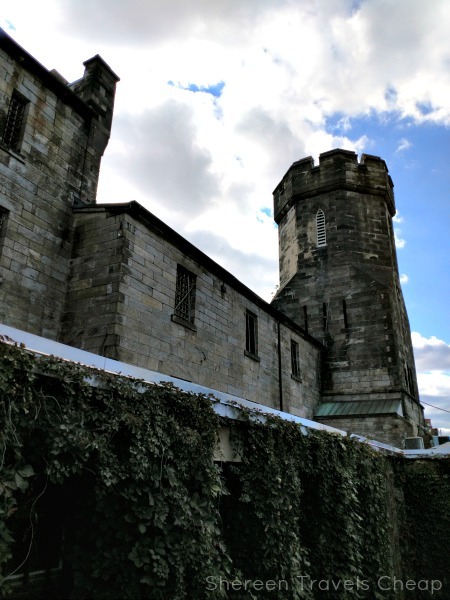 The prison was built to resemble a castle with ramparts and towers and everything that goes along with that, but you'll find that much of this is for show. The ramparts are fake and the slit windows that would be used for archers to protect the stronghold are also fake, but the facade does its job to be intimidating. You enter through a portcullis and then are pointed into a small hallway, which already starts your tour off before ever buying tickets. Here you can see that tiny door, which might have been 3 feet tall. The one hour a day they had outside was also segregated from the rest of the prison, unlike prisons today. This is what almost all the cells available to the public look like. The wall paint cracked and peeling, the ceiling crumbling and all the furniture breaking down. 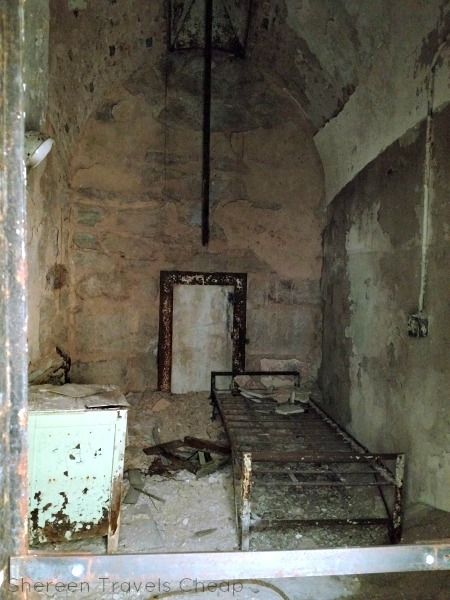 The prison was built in 1829 and used these cells until 1913 until they abandoned the solitary prisoner program. The prison was much more contemporary from then until it closed in 1971. The prison laid empty, aside from many stray cats, until the late 80s. 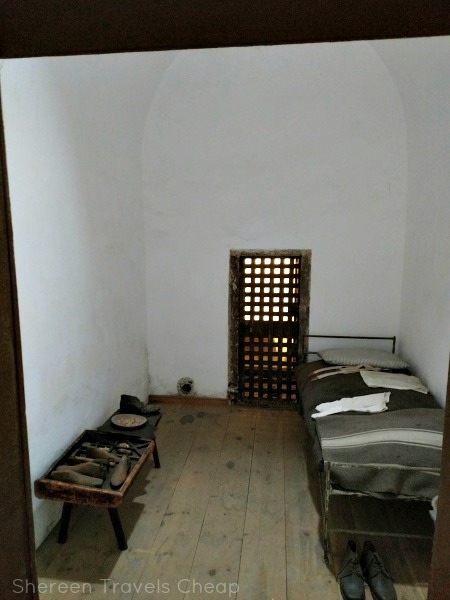 Here you can see a recreation of a cell that once belonged to a cobbler. He was one of the few who had a job inside the prison. You can see his shoemaking/cobbling tools on the table on the left. Notice how sparse his cell still was. The prison has a spoke style, so all the cellblocks radiate from a central hub, which you can see here. Many prisons after adopted that same structure. Half of the cellblocks are open to tours and the other half are uninhabited. You can view them from the hub, like the following photo. 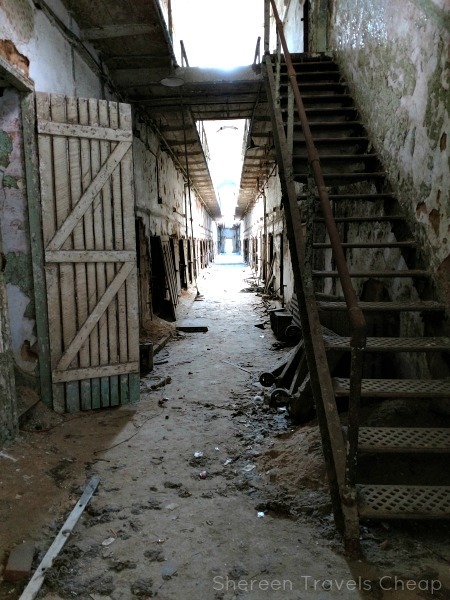 I can only imagine how eerie those cells and walkways are, considering how creepy the rest of the prison felt with it's hard floors, small cells and echoing hallways. There's also an entire second floor, which is off limits. You can certainly tell why. You are able to climb a set of stairs to get a closer look at this dilapidated side of the prison and get a bit of a chill from the view. I imagine they look worse than this and are darker and danker. 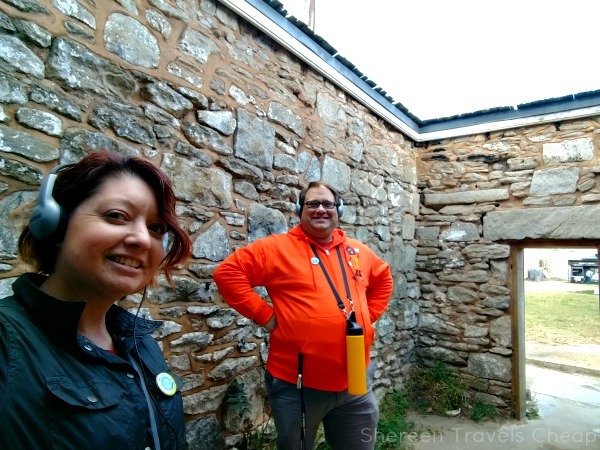 We made a trip out into the main yard where we could see both a sealed door that went into an original cell "yard" and an opened one that we could walk into. 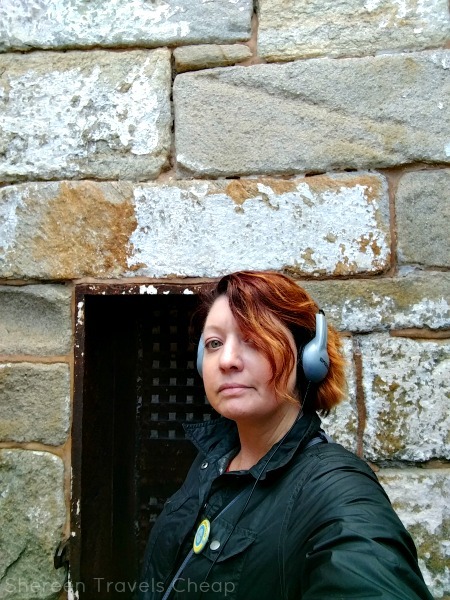 Not only can you see that this door is still really small (I'm 5'1" and my head brushed the top), but the walls are super fortified. Any time a prisoner was moved around the prison and got to go outside into their private yard, they had to wear a bag on their head. They didn't want them to know anything about the layout of the prison. 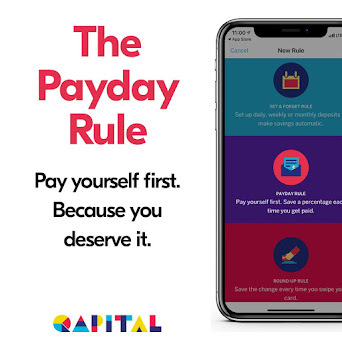 How fun, right? They wanted prisoners to be penitent and to be repentant for their crimes. There are only two of us in this "yard" and there isn't much other room left. The outside area is about the same size as the inside, meaning prisoners really only got some fresh air (through their bag) and a little sun while they were outside. I have no idea if they still went out in the rain. 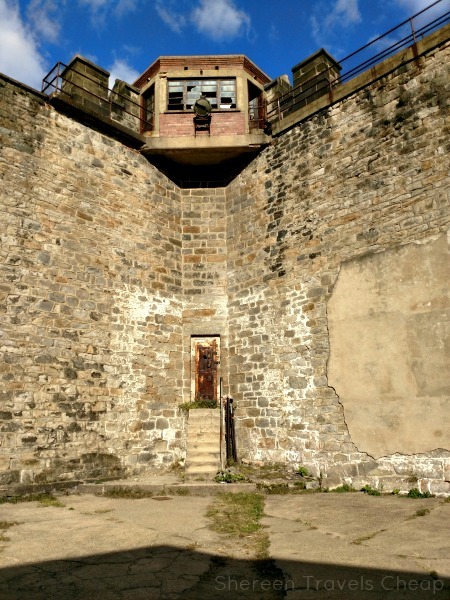 This is one of the guard towers, which looks out over the whole prison. Notice how the catwalks and spotlight give great vantage points and would make it almost impossible for a prisoner to escape being seen. Back inside the prison, some cells are set up for art exhibits. This was really interesting, because it gave it both a more somber feel and a more hopeful feel. This was one of my favorites, as it pays tribute to those who lost their lives to murderers who were locked up at Eastern State. Cindy Stockton Moore's exhibit, entitled Other Absences, had a series of drawings of murder victims that she was able to find photos of. They may be gone, but they are not forgotten. I strolled along a whole block where the back wall had crumbled and had just become a part of nature. Vines and plants have taken over and many had trees and branches taking up the entirety of the cells. 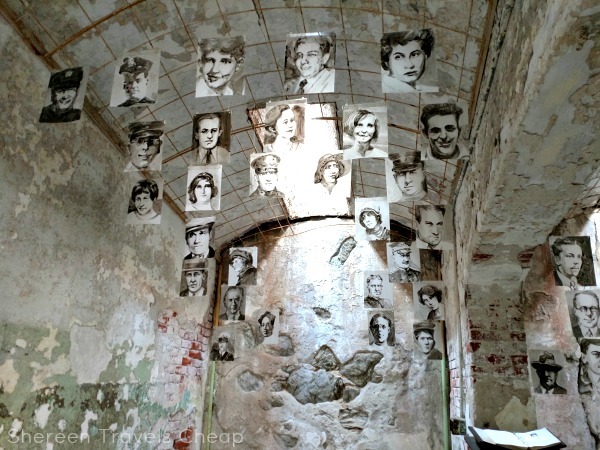 And then there were the infamous and prominent prisoners who called Eastern State home. One of those, who spent a very "grueling" 8 months there was Al Capone. As you can see, he had it super hard. It was said that he was a favorite of the warden and as such got special treatment. 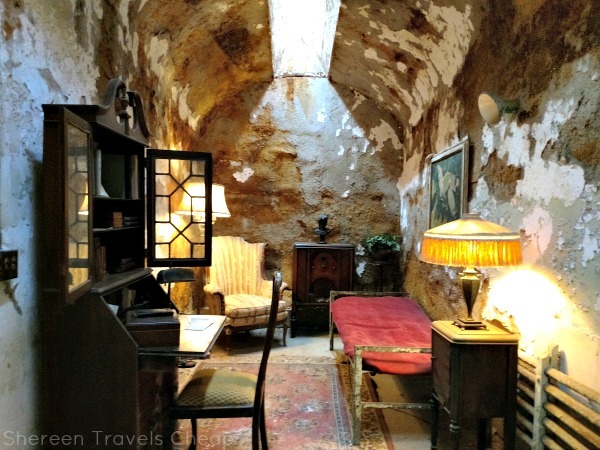 It's not 100% clear if Capone actually lived like this in Eastern State, but what is known is that his cell was no bigger than anyone else's, so thank goodness for small favors, I guess. If nothing else, you can see that bribery and charm will get you everywhere, even if it's just a more comfortable tiny space than anyone else got. I'd just as soon not have to go to prison in the first place. Capone made the rounds in prisons after his short stint in Eastern State, also spending time in Alcatraz. 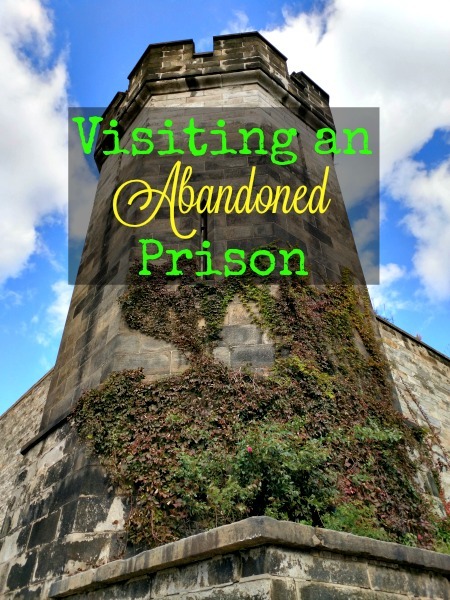 If you're interested in prison history, abandoned buildings, prisoners or both, this is definitely a must-do on your Philadelphia trip. You can easily spend half a day wandering the grounds and building. We were there for probably 3 hours and there were many "side quests" on the audio tour that we skipped or didn't get to, as we were getting hungry. I'd love to go back to do a private tour. Make sure to bring good shoes when you visit, because you will walk a lot and there is some uneven spots. I'd recommend closed-toe shoes. If you can visit on a weekday, you'll probably face a much thinner crowd. We went on a Wednesday afternoon and there were hardly any people. I think we had just missed a large group. Most of the hallways were deserted, which made it easier to spend as much time exploring as possible. 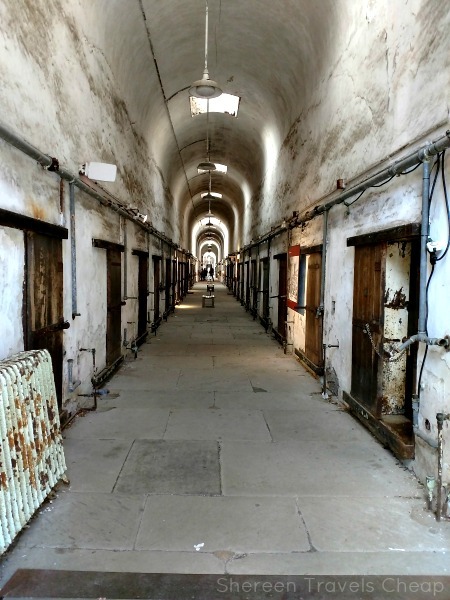 If you are into haunted houses, Eastern State hosts Terror Behind the Walls on certain nights leading up to Halloween, and it is said to be the scariest haunted attraction in America. I'll never know, because that isn't my thing, but it appears that people jump out of cells at you and the prison is plunged into darkness during the event, so that alone would be too much for me. 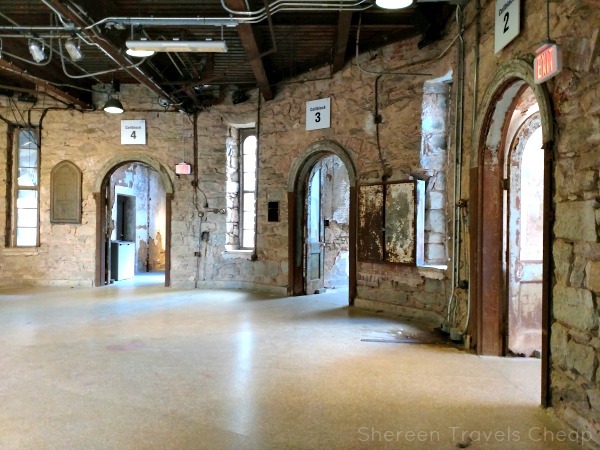 Do you have any closed prisons on your travel list? If so, which ones? 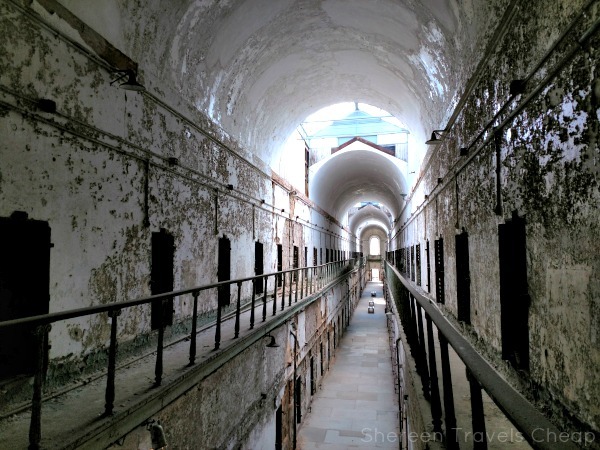 Disclaimer: Visit Philly gave me a VIP attraction pass in order to visit Eastern State Penitentiary at no cost, but all opinions are 100% my own.